Antonio Cromartie has been selected for the Pro Bowl three times in his eight-year career with the Jets and Chargers. TEMPE, Ariz. (AP) — A month from his 30th birthday, Antonio Cromartie is coming to the desert to face the challenges of the NFC West. The three-time Pro Bowl cornerback signed a one-year contract with the Cardinals on Thursday, saying he was lured by the team’s aggressive pursuit of him and the fact that the team is on the cusp of the playoffs. "I was looking for a team that was contending," Cromartie said at a late afternoon news conference, "and I found it. Like I said, they are moving in the right direction." 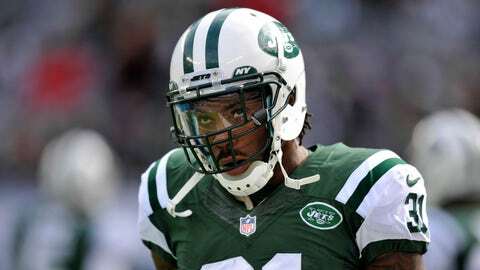 Despite Cromartie’s pedigree, there was no avalanche of interest from other teams when the New York Jets released him on March 9. An NFL source said the deal is worth a base salary of $3.25 million. Cromartie can make an additional $500,000 if he plasy in every game for the Cardinals this season. "I don’t know. I really don’t know," he said when asked why he didn’t have more offers. "Maybe it was playing into my age, I don’t know. Maybe it was playing into my hip. No one knew the outcome of my hip from last year or anything like that. I don’t know, but I’m happy where I’m at." Cromartie was bothered by a hip flexor strain the first 12 weeks of last season but said it improved over the final month. "Right now, I feel like I’m 100 percent," he said. "I’ve been running around, cutting and doing everything else. I haven’t had any problems with it." The Cardinals’ move is in line with a flurry of one-year deals general manager Steve Keim signed players to in his first months on the job last year. The approach worked well last season with veterans such as linebacker Karlos Dansby and it also gave the team flexibility to move on if players didn’t pan out. "Just like a lot of the other guys that we’ve signed in the past, I feel really good about the fact that a guy who has a chip on his shoulder, has huge upside, has all the physical tools and has played at a high level," Keim said, "and now we’re bringing him in on a one-year deal where he’s ready to prove to the NFL and the world that he’s still the same kind of guy." Cromartie called his release by the Jets and the relative disinterest from other teams "big-time motivation" for his coming season. "You don’t get many phone calls, but it’s motivation to come out for one (year)," he said. "You are part of a team that is right where it needs to be. It is a team that is committed to winning and also a team that is right on the edge, on the verge of being a Super Bowl championship team and that’s what you look for. I’m a veteran guy. I’m going into my ninth year, and that’s what you look for." Cromartie led the Jets last season with three interceptions. He also had eight passes defensed and one forced fumble. He was released by the Jets on March 9. In his career, Cromartie, the No. 19 overall pick by the San Diego Chargers in the 2006 draft, has 28 interceptions, 97 passes defensed, two forced fumbles and two fumble recoveries. He has had two interceptions in the playoffs. Cromartie is expected start alongside Pro Bowl cornerback Patrick Peterson, who played an unsolicited role in recruiting Cromartie via Twitter. Tyrann Mathieu played the nickel corner as well as safety as a rookie last year before going down with torn knee ligaments. Cromartie called that a formidable trio. "When you add all three of us into the secondary," Cromartie said, "it just speaks volumes of what this secondary can be because you have three guys on the back end that have the potential of making an interception and turning it into a touchdown. You have three playmakers on the back end. That’s what you are looking for. You are looking for guys to be a great tandem on the back and be game changers at the end of the day." Cromartie reportedly was interested in returning to the Jets but visited the Cardinals last week. He was named All-Pro after leading the NFL with a career-high 10 interceptions in 2007. He has scored five touchdowns, including a 109-yard interception return that is tied for the longest play in NFL history. Cromartie has missed one game the past four seasons. He is the third significant free-agent signing for the Cardinals, joining left tackle Jared Veldheer and wide receiver-kick returner Ted Ginn Jr. Last season’s other starter at cornerback, Jerraud Powers, could be a candidate to be released or move into a nickel role. Hiscap number for 2014 is $4.75 million. That’s a lot to pay if he’s not the starter, but he isa favorite of coach Bruce Arians and the Cardinals still need depth at corner despite also having Justin Bethel and Bryan McCann in reserve. Cromartie played his first four seasons in San Diego after being drafted in the first round out of Florida State in 2006. He led the NFL with 10 interceptions in 2007. He is the cousin of former Cardinals cornerback Dominique Rodgers-Cromartie, who just signed as a free agent with the New York Giants.